"Teens will regularly share things widely on Facebook simply because they see no reason to make the effort to make those pieces of content private" (Boyd 62). In Chapter 2 in Boyd's novel, I find this quote to be very relatable. While I do not consider myself an active poster on Facebook, this applies to other social media apps such as Instagram and Snapchat. When attempting to explain the concept of these new apps to my mother, who is technologically challenged, she often rebuttals with Boyd's common perspective of parents viewing these posts as irrelevant and even sometimes as a violation of my privacy. While I am not doing anything wrong, it is just the competition of mindsets of different generations. For example, when considering to post a happy birthday post on Facebook or tagging my friends in memes, I could send it by text or I could even copy the link of the meme and send it through more private means. However, it just does not seem necessary to go through the extra steps when it does not matter whether others will see this post. Just because I don't find this particularly necessary to send privately, does not mean I do not care about my privacy rights. In this regard, matters I truly want to keep private I ensure are not posted on any social media. On another note, Boyd references a student that erases her daily usage on Facebook to prevent people from using her previous comments against her later on. I disagree with this because I think while comments can be trivial, one should always consider the implications of their posts and, therefore, if they do not want to accept the consequences for their possible posts, they should not be using social media. The episode of this Podcast was very interesting and managed to keep my attention for the duration of it. It utilized multiple voices along with different people to help explain different ideas in order to prevent one voice from becoming too monotoned. In addition, the podcast used upbeat music at times to illustrate examples which also helped bring the listeners back to focus. My favorite part was how they kept the listeners captivated which involved explaining their examples thoroughly to ensure that all listeners of any caliber could process the information being told. This was used by allowing the listeners to listen to the sounds the vocoder made as well as listen to the sounds that occurred when sending messages during private conferences. I also enjoyed that the podcast had a similar script below it to allow listeners to follow along with the speakers to prevent them from getting lost. Within this script, there were pictures so the listeners could visualize what the speakers were talking about and better understand the vocoder and its capabilities. Furthermore, I liked that the script provided was not exact to the speakers dialogue because as it allowed me to keep track of their stories and explanations, but I did not feel like I was reading either or that it was too repetitive. Based off of this, I want to incorporate multiple voices into my podcast as well as an outlined script below possibly with pictures to help the listeners follow along and better understand the topic of the podcast episode. While Enigma appeared unbreakable to the world, it was only a matter of time before a weakness would be discovered. This weakness occurred due to the laziness and tiny errors of the German workers. As a result, the Allied powers exploited this weakness and were able to win the war. The laziness that allowed for this victory was the German's repetition. One example is that the Germans each day would send their message key twice in the same message to ensure that the receivers enciphered the key word correctly. It was the Germans' laziness to send the same code twice in the same message because with enough messages from the day, the cryptanalysts had the ability to find patterns within the messages that would grant them access to break the code and decipher messages from that day. With the constant little mistakes, the Allies were able to decipher enough messages in order to gain an advantage against the Germans. Also, although not strongly mentioned in the Singh chapter, the Allied powers' secrecy also aided in their war effort. Once deciphering certain messages, they were enable to ensure the Germans did not become aware of their advantage and decipherment allowing them to continue to gain knowledge from certain messages without them changing the key from that day. With a combination of the repetition of the messages, the ability to find a pattern, and the secrecy, the Allies were guaranteed the advantage and were able to win the war. When the 9/11 attacks occurred on American soil, the government had to respond in a certain manner to ensure the safety of its people. Based off of an argument brought up by Cory Doctorow in his novel Little Brother, I agree that the government first has to protect the safety of all citizens above anything else. Therefore, the government's action to look into previous phone calls and other similar information I believe is justified. While I also advocate for privacy rights, technology has such an affect on globalization that the government would not be able to ensure these terrorists were brought to justice if they did not search through these messages. However, my concern is: when does this investigation stop? The government can be justified for looking to catch the terrorists and their accomplices, but how do we know that once they are found the government will stop peering on our personal data. The answer is that we don't. It is this sole reason that causes me to deter the allowance of the government to have access to this technological data. At times our rights have to be compromised to ensure our safety, but when will we be certain that we will ever be fully safe again. It is arguments like this that continually give the government justification to continue their investigations through people's private matters. Therefore, I would grant access to the government for these investigations if I could be assured there would be a set termination to the investigations. For example, if the information could not be found after a few months, then it would be halted. I believe this serves to establish the perfect medium between ensuring privacy rights while also ensuring the safety of the citizens of the United States. In the time of Mary Queen of Scotts, Mary, her conspirators and others trusted the encrypted messages would remain secret, trusted the difficulty of their key, and trusted the inability of others to decipher coded messages. Even though they were not aware that their trust ended in Mary Queen of Scotts death sentence, it was this lack of knowledge and lack of paranoia that allowed this to occur. The environment in Chapter 2 represents that of knowledge and awareness. As people were able to decipher others coded messages it posed the question: who says they can't determine mine? With this increasing awareness of other peoples similar capabilities, this then caused a lack of trust in the system and even deterred from the use of encryption. If an encrypted message was likely to be decrypted by an unknown and unintended recipient, there was not point in writing the message. The ability to decipher others messages also turned into a game. For example, since people did not trust the mail or content of the letters from being discovered, they attempted to write notes in newspapers where at least their identities could remain anonymous. However, cryptanalysts then responded to these messages using the coding system in the previous message. In one instance, a woman aware that her code had been broken warned her recipient through the next newspaper that the code had been broken except she used the same code to relay the message and stated his name. This scenario is humorous as the woman now told the cryptanalysts the recipient's name making the system just as compromised as letters had been. Overall, the new environment caused awareness to increase leading to more caution in transporting private messages, and also led to the yearn to create more difficult coding systems that could not be deciphered easily. The Bill of Rights continues to stand to defend our individual rights within the United States. In Doctrow's "Little Brother" these individual liberties are compromised when a bombing attack occurs in the town. As security in the town of the novel saw a severe increase, privacy rights were jeopardized as a result. In Marcus's history class, there was a contentious debate regarding the suspension of the Bill of Rights at times when safety is more important. 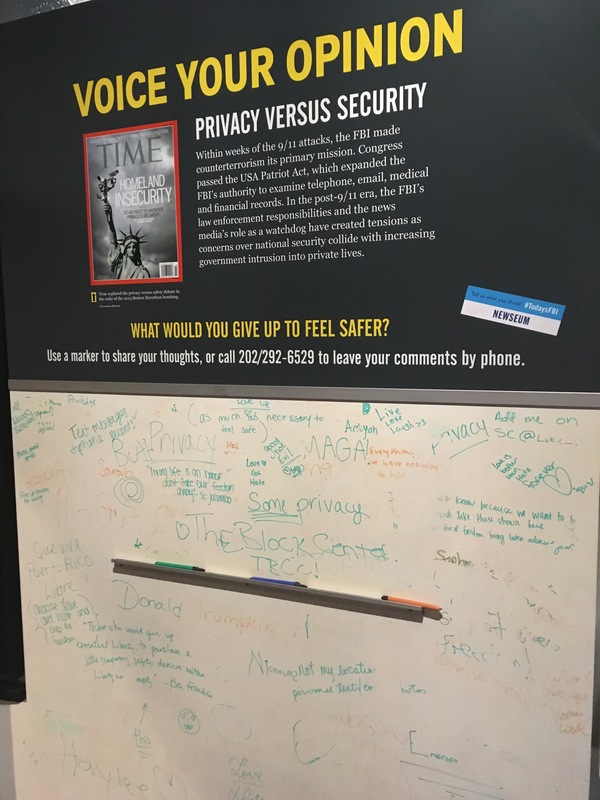 Marcus believed that these individual liberties should never be compromised while his new teacher and enemy in the class, Charles, believed that security should always be the priority. They further went on to argue regarding the origin and purpose of the Bill of Rights. While Marcus believed its purpose was to keep the government in check, the teacher and Charles believed it was an outdated form used to oust the Kings at the time when it was created. As a result of Marcus's argument, he gets sent into the principle's office where he is reprimanded for exercising his first amendment in class. While I have always been an advocate for free speech, my view on privacy rights changed throughout reading the novel. Prior to reading this novel, I agreed that it is necessary to compromise certain liberties in order to ensure our safety. 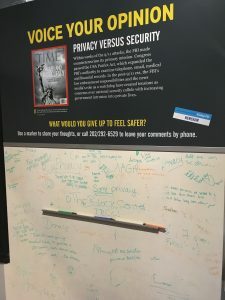 However, learning about all the ways our privacy has been compromised without our knowledge, and the ease in which more of our rights can be infringed upon has caused me to have a deeper appreciation for the Bill of Rights. In specific regard to the Fourth Amendment, while our safety is essential, more government security measures can only ensure our safety to an extent. Furthermore, I found myself siding with Marcus in that America is a place for freedom, and although our safety is vital, once we let the government infringe on our rights there is no assured stopping point. Even if measures do get out of control, the Bill of Rights encourages us to challenge the government to ensure our democracy is kept in check. The Bill of Rights was written to defend us so why work against it? Are You Going to Let Fear Infringe Upon Your Right to Privacy? The idea of uncertainty has left people in a frenzy for ages. However, with the improvements seen in technology we have begun to uncover what had previously been unknown to us. Morris, in his essay "Mining Student Data Could Save Lives", highlights the ability to limit undetected campus violence through the use of data mining. As Universities already provide significant online resources, it would not be difficult for them to use software to single out erratic behavior among students. While Morris does acknowledge issues regarding the right to privacy, he firmly believes that data mining in college campuses is not significantly different than social media recognizing one's likes and dislikes. As a result, he supports the usage of data mining which he believes will aid in limiting the violence that occurs on college campuses and create a safer environment among students and faculty. As Morris's concerns for the safety of college campuses prove to be a valid argument, this is an invasion of our privacy. Safety is and always will be a priority for our country but the fear of not knowing the future has led to significant infringements on our right to privacy. Now one might argue, have we ever even had the right to privacy? Even though it is assured in the Constitution, security always trumps privacy rights. America is known for its freedom- it's even recited in our Pledge of Allegiance on a daily basis. However, with the implementations of these safety precautions as recommended by Morris, this pledge loses its value. Measures similar to data mining have already been enacted limiting the amount of privacy we have. Another software system would lower the little privacy or even eliminate the privacy which we believe we have left. Even though it will provide safer environments, it is already known that it cannot be expected to be completely accurate. This just further proves that it just isn't worth it. We will never be able to predict what will certainly happen tomorrow, it just statistically is not possible. We need to learn how to live with this uncertainty if we want to salvage the little privacy we have left. Imprisoned for 18 years in England, Mary Queen of Scots welcomed the idea for a plan to escape the prison cell. However, as the plan was developed through writing, the use of an encryption system, even if it was weak, provided Queen Mary and Babington with a sense of security that prompted them to outlines all plans within these letters. This feeling of falsely assumed security not only put them at risk of their letters being deciphered easily, but also indicated through the use of an encryption system that the letters contained covert information. As the courier or double agent encountered these encrypted messages it caused them to be immediately examined in order to determine its contents. To England's advantage, the use of the weak encryption enabled the letter's message to be exposed, and also granted the ability to be tampered with so Walsingham, one of England's ministers, could acquire sufficient evidence to prosecute both Queen Mary and Babington with concrete details of their involvement. Had the letters not been encrypted, not as much information regarding the plan would have been revealed leaving the English without unwavering evidence which could have prevented Queen Mary's death sentence. The weak encryption was the underlying reason for Queen Mary's death sentence. The trial of Queen Mary served to illustrate that ignorance of one's surroundings and trust is deadly. If coded information needs to be transported between two parties, steganography is not enough. A mixture of both steganography and a complex cipher must be utilized. The hiding of the letters adds one level of security but in the case of Queen Mary and the potential presence of a double agent, a complex cipher, not a nomenclature, should be utilized to ensure letters found cannot be interpreted by the unintended reader. In conclusion, those who need to keep their communication a secret must prepare for the worst scenario. However, even the most remote hiding location or complex cipher cannot ensure complete secrecy. As a result, those who participate in cryptography must always recognize the risk of being exposed.